We offer a range of Celestite pieces, including tumbled Celestite, rough pieces, and more. We occasionally offer carved pieces and Celestite cabochons. A gorgeous blue mineral, found worldwide in fairly small pieces. Most of the light blue pieces are found in Madagascar. This mineral is composed of Strontium Sulfate, which sounds scary – Strontium 90 is one of the most dangerous isotopes in nuclear fallout. However – Strontium90 is a synthetic isotope that is only created in nuclear fission. Naturally occurring Strontium is safe. 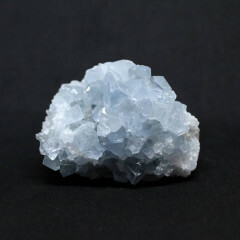 Celestite is used as a natural source of Strontium, which has a range of applications, in metal alloys and pyrotechnics. This mineral is usually sold rough, in its crystalline form, tumbled or cut into cabochons for jewellery. Celestite tumblestones are gorgeous little clear blue stones and are usually quite a fast seller. This gorgeous blue stone is said to help you contact angels – some believe it is especially useful when used with Angelite or Danburite. Crystal healers believe it can be used for helping with disorders of the sensory organs – the eyes, nose, ears, etc. It is also thought to help with dream recall, remembering your dreams and helping to understand them.